Donald Trump’s win in the 2016 U.S. Presidential election caught many by surprise. To sort out how various demographic groups voted, close observers turned to the national exit poll by Edison Research, a staple of election night reporting and analysis. The exit poll dished up another shocker: It said Hillary Clinton picked up 66 percent of Latino votes, and Donald Trump earned 28 percent. What was so surprising about these figures? For starters, it meant that Clinton fared 5 points worse than Obama’s 71 percent showing among Latinos in 2012. It also meant that after a year of Trump slighting Latinos – claiming a judge could not be impartial because of his Mexican heritage, insulting the famous Latino reporter Jorge Ramos, fat-shaming Miss Universe winner Alicia Machado, and labeling Mexican immigrants as rapists and “bad hombres” and promising to build a border wall to keep them out – he still had a better showing than Romney in 2012, by 1 percentage point. Beyond that, the exit poll figures ran counter to the general trend in American partisan dynamics. Since the 1990s, Latinos have increasingly distanced themselves from the Republican Party and offered their votes to Democrats. Could it be that in 2016, Latinos were thinking twice about lending their muscle to the Democratic Party? The answer is no. Close inspection of Latino voting patterns across several states – including Arizona, California, Florida, New York, and now Nevada – reveals that the exit poll credited Donald Trump and Joe Heck, the Republican candidate for Nevada’s U.S. Senate, with many more Latino votes than either actually received. Here is how we reached this conclusion in Nevada. First, we gathered official 2016 election results for 1,703 precincts across the following Nevada counties: Carson City, Churchill, Clark, Douglas, Elko, Lyon, Nye, and Washoe. (Nevada has 1,853 precincts. 98 percent of the state’s voters live in the precincts we examined.) Next, we compared these actual votes to election results for the same set of precincts in 2012. Then, using information provided by Catalist, a proprietary campaign data vendor, we sorted these comparisons by the known demographics of voters who live within each precinct. Finally, enlisting a statistical technique called ecological inference (developed by Harvard Professor Gary King), we calculate a reliable estimate of how Latinos voted. Why do we consider our results more accurate than the exit poll, which is a state-by-state survey conducted by Edison Research? Because the poll is based on a sample of voters in select precincts that are targeted for fast data collection to report on election night. Like all other polling efforts, the exit poll is subject to error because the sample may not represent the whole and because people don’t always tell the truth about how they voted. Our numbers reflect the actual ballots of 98percent of Nevada voters. As we said above, the Edison exit poll reported that 60 percent of Latinos backed Clinton, and 29 percent gave their support to Trump in Nevada. The numbers from our analysis are quite different: 88 percent for Clinton, and 10 percent for Trump. 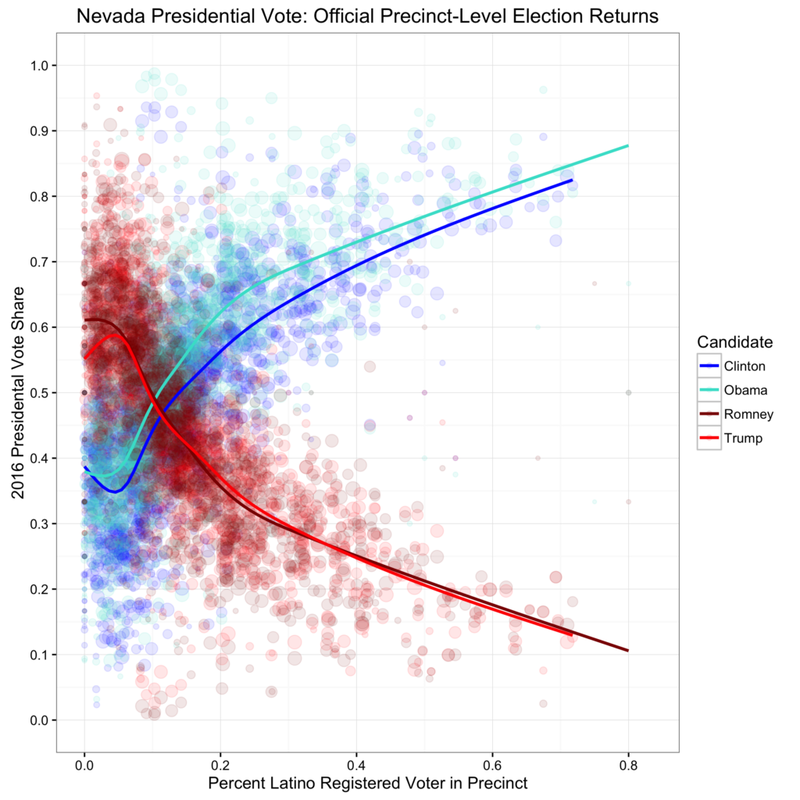 When we sort Nevada precincts according to the percentage of registered voters who are Latinos, as we do in following graph, the data reveals that greater support for Clinton occurred in Latino-concentrated precincts than the exit polling showed. Each dot represents a precinct. The more raw votes a candidate won, the higher the dots rise on the vertical axis. Along the horizontal axis, the dots are sorted by the percentage of Latino registered voters in each precinct. The colored lines track our projections of precinct vote shares for candidates. It is therefore extremely unlikely that more than one in four (28 percent) Latinos in Nevada turned out for Trump, as purported by the exit poll. Instead, it is likely that Clinton won just under 9 out of 10 Latino voters, leaving 1 in 10 to Trump. Combined with our research on Latino voting in Texas, Arizona, Florida, and New York, our probe of presidential election results in Nevada adds more to the mounting evidence that the national exit poll simply missed the mark on Latinos. Much closer to our independent analysis than the exit poll are the figures from an “entrance poll” conducted of Latinos in the days prior to November 8. The research firm Latino Decisions made the pre-election survey calls and found Latinos in Nevada at 83 percent support for Clinton, with 16 percent for Trump. Nationally, Latino Decisions had 79 percent of Latinos voting Democratic, with only 18 percent voting Republican. The top-of-the-ticket race in Nevada isn’t the only election result that underscores our general findings. Nevada voters elected Catherine Cortez-Masto, the first Latina to sit in the U.S. Senate. That could not have happened if she had fared worse than Democrat Shelley Berkley, who lost her bid for Senate in 2012 to Republican Dean Heller. It also could not have happened if only 61 percent of Latinos had backed Cortez-Masto, as the exit poll claimed. As shown in the graph below, in precincts where Latinos make up at least 50 percent of registered voters, Cortez-Masto outperformed Berkley in 26, tied in 3, and did worse in only 4. According to our analysis, Cortez-Masto won 88 percent of Nevada Latinos, which again is much closer to Latino Decisions’ national estimate of 79 percent support for Democrats than the exit poll. 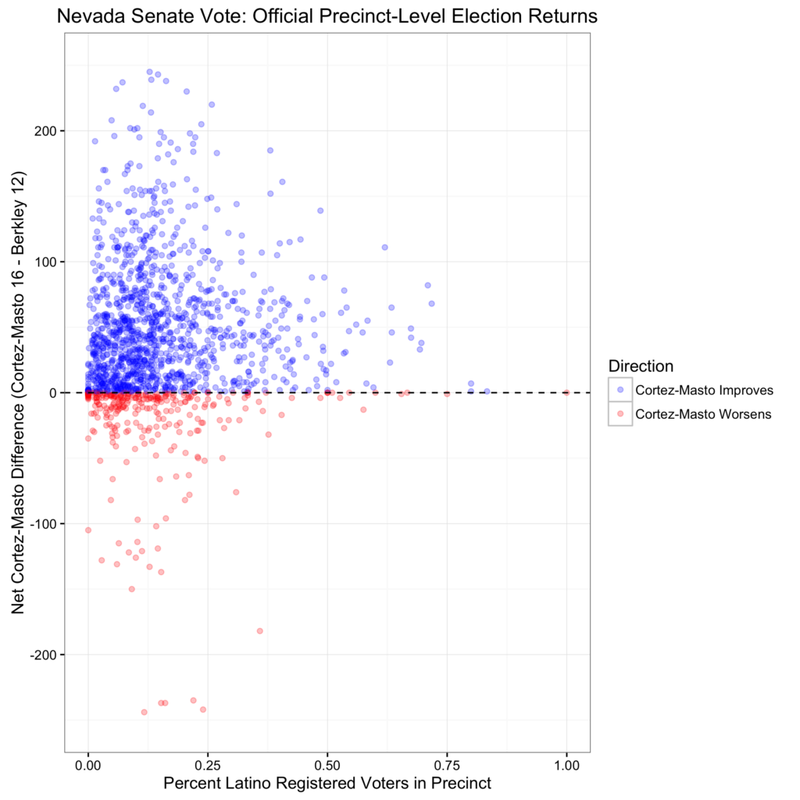 All in all, our research shows that Nevada’s Latino voters did not vote Republican in increasing numbers in 2016 as compared to 2012, as has been claimed by some. The weight of the evidence, in Nevada and elsewhere, strongly cautions against concluding that Latino voters are beginning to reverse their trend away from voting for Democrats. Why does all this matter? Voting patterns drive policy. The demographics of Nevada, which include steady growth in the Latino population, mean Latinos are becoming an increasingly influential voting bloc. Every democracy needs good data. When it comes to the Latino vote, the national exit poll isn’t good enough. Francisco I. Pedraza is an Assistant Professor in the Political Science Department, University of California, Riverside. Bryan Wilcox-Archuleta is a PhD Candidate in the Political Science Department, University of California, Los Angeles. Their data files for this research can be accessed here.